Everybody is talking about Huckleberry Finn these days. A new edition of the book has been released that censors the "N-word," substituting the word, "Slave." As I said in class, Huckleberry Finn is one of the most banned books in America. In recent years the main complaint against the book has been the racial terminology that Twain used. Most English teachers and professors defend Twain's terminology. The book is a masterpiece, they say, and he used the terminology to point out Whites' intolerance and needless prejudice against African-Americans. 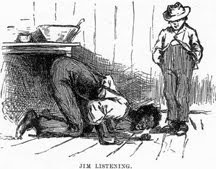 Indeed, by the end of the book, the escaped slave, Jim, emerges as one of the heroes of the book, especially as compared to Tom Sawyer. If you read the whole book, you won't be prejudiced, no matter what language is used. Other people insist that changing the word doesn't change the book. It just makes it more accessible to readers who might be offended by racial slurs. THE ASSIGNMENT: The New York Times featured a number of voices in its "Room for Debate" feature this month. Read through the essays and find one of the authors who deserves your response. Post your response to as a comment below this blog.